Best Buddies Prom… it’s kind of a big deal. It’s the day that every Buddy Pair across Tennessee looks forward to all year long – and for good reason. It’s an enormous party where every single guest gets the five-star treatment! From the outward appearance, it may seem like any other Prom. But a closer look shows something much more meaningful. On this special day, over 2,000 teens and young adults with and without intellectual disabilities laugh, dance, sing and have fun together. There’s no judgment, ridicule, bullying or isolation. Just PURE JOY. Everyone is welcome, and everyone is equal. It’s a snapshot of true friendships between individuals of all abilities. And once the party’s over, the friendships last forever. That’s a pretty big deal. Online Registration is now closed. Please contact tennesseeprograms@bestbuddies.org or (615) 891-2046 with any questions you may have. 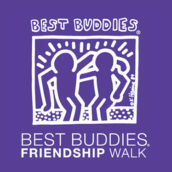 Fall 2019 Nashville, TN Join us at the Best Buddies Friendship Walk, the number one walk in the country raising awareness and funds to support individuals with intellectual and developmental disabilities (IDD). July 10, 2018 Nashville, TN Bluebird Café You won’t want to miss seeing the amazing songwriters we have lined up for Writers in the Round at the legendary Bluebird Café on Tuesday, July 10th. 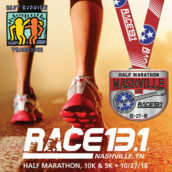 October 27, 2018 Nashville, TN Bicentennial Mall State Park Race 13.1 is returning to Music City for the fourth Halloween-themed Race 13.1 Nashville half marathon, 10k, and Best Buddies 5k! Whether you’re a long distance, competitive, or recreational runner… there’s something for everyone!